City life is becoming increasingly more stressful nowadays. Because of this, it’s very important to take a break and relax every once in a while. And what better way of escaping the hustle and bustle of the city than to take a nice trip through nature? There’s plenty of great options if you’re thinking about doing that. With summer now just around the corner, this is the perfect time to get your ears wet (literally) and start learning one of the most popular underwater activities out there – snorkeling. Snorkeling has been around for quite a long time and with good reason. This activity is fairly easy to learn and can help you experience some truly unique sights. The oceans and seas have plenty of interesting environments and wildlife just waiting to be explored by adventures. And, of course, the best way of exploring the waters is from within. That’s exactly what snorkeling will allow you to do. If you’d like to get an even better grip on the basics, give our guide a read where we explain the mechanics behind snorkeling. Needless to say, you’ll need to learn a couple of things before you can go on your first snorkeling session. You’ll need to know what kind of gear to use and the correct way of breathing while underwater. You also to learn how to move properly while you’re snorkeling because it’s a bit different than swimming. If you want to learn how to snorkel so that you can get the most out of this activity, you’re in the right place. If you have a more pressing question please refer to the Table of Contents below. How to Fit Your Snorkeling Mask? How to Use a Snorkel? Can You Snorkel Underwater with a Dry Top Snorkel? 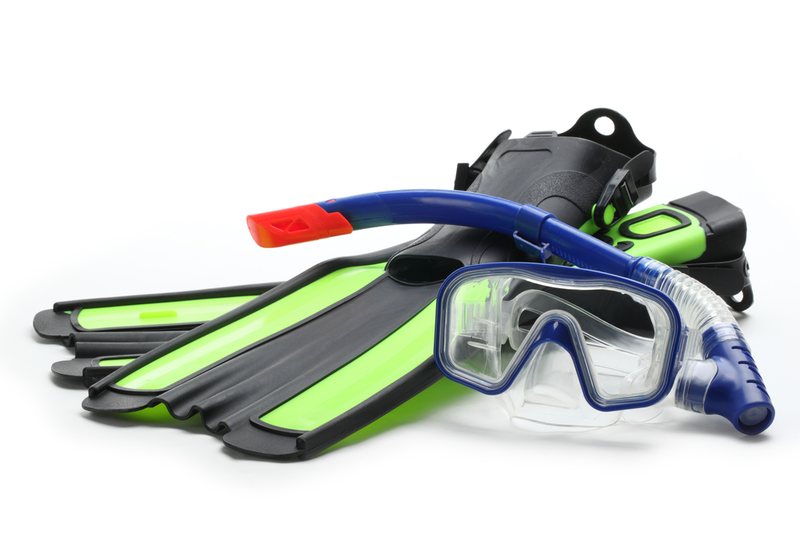 You’ll need a few pieces of gear before you can start snorkeling. You can either rent the gear you need or outright buy it, and there are many places that sell all of these items. If you’re new to snorkeling, it might be best to just rent the equipment. Like everything else, this activity isn’t for everybody so no point in spending too money before trying it for yourself. Regardless of how you get your hands on the gear, it’s very important to check the quality of every piece. Everything needs to be top quality in order to keep you safe while underwater. Your overall enjoyment of snorkeling will also depend on how good your gear is. So, what do you need? First and foremost, you’ll need a mask and snorkel combo. There are also full-face snorkeling masks out there (our shopping guide and reviews here), but if you’re not going for one of those, the mask and snorkel will be separate. In addition, you’ll also want to get a good pair of fins to go along with everything else. It’s also a good idea to also get a rash guard or possibly even a wetsuit. You’ll need some sort of protection either way, but the exact equipment you want depends on how cold the water is. Making sure the mask fits perfectly on your face is vital. Snorkeling masks come in a variety of shapes and sizes so look for one that’s perfect for your specific face. You’ll want to make sure the mask isn’t too loose or too tight. In other words, it must form a perfect seal around your face. A simple way of testing this is by putting on the mask and breathing in through your nose. Ideally, the mask should then form a seal around your face and should stay put without you having to hold it. It’s very annoying to go snorkeling with a mask that doesn’t fit properly so make sure to test it out before going for a dive. A leaky or foggy mask is one of the biggest causes of ruined snorkeling experiences. A snorkel is a specialized piece of equipment that allows you to breathe through your mouth while submerged. 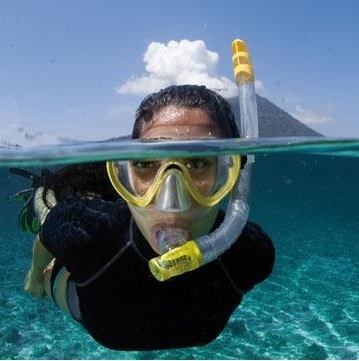 You will not be able to breathe through your nose using a traditional snorkeling mask, so practice breathing through your mouth via the snorkel. Given that it’s your only means of breathing underwater, it goes without saying that the snorkel must be in your mouth at all times. However, it’s important not to bite down on the tube because your jaw will get sore in no time. Instead, simply hold it in your mouth and practice breathing through the tube in a relaxed manner. The angle at which you hold your snorkel in respect to the water is very important as well. You will be, after all, sucking air in through that tube. If the end of your snorkel gets submerged and you try to breathe in, you will essentially turn your snorkel piece into a drinking straw. Yikes! Quite a common question when it comes to picking a snorkel. There are a few different types of snorkels to choose from, but if you’re a beginner, you’ll probably want to go for a dry top snorkel. This type of snorkel comes equipped with a safety valve that prevents water from entering it when the snorkeler is underwater. If a bit of water does somehow get it, the snorkeler can simply blow into the tube to get rid of it. Dry top snorkels aren’t really meant for free diving so it’s better to stick close to the surface if you’re using one. Experienced snorkelers are able to dive a bit deeper than recommended and stay underwater with the entire snorkel tube submerged. However, doing so requires snorkelers to be able to hold their breath for the entire time, which is easier said than done in many cases. 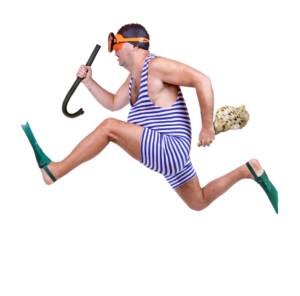 Upon returning to the surface, the snorkeler can make use of the aforementioned safety valve to blow out any water that may have seeped in and start breathing normally again. Although possible, snorkeling with the entire tube submerged is definitely not something you should be trying unless you have plenty of experience with this activity. A lot of people’s first snorkeling experience takes place at their local swimming pool rather than in the Bahamas. Not only are swimming pools great for testing your gear, but they are also the perfect place to practice your breathing. After a few snorkeling sessions in the swimming pool, it’s time to go for something bigger. You’ll want a location with calm waters and plenty of interesting things to see. The most popular snorkeling spots might not be the best option because large crowds of people tend to scare away the local wildlife. At the same time, it’s not a good idea to go snorkeling by yourself either, especially if you’re a beginner. Ideally, you’ll want to grab a group of friends and go on an adventure together. Knowing How to Swim is Useful but Not Mandatory? This is one of the most commonly asked questions by those looking forward to their first snorkeling experience. The answer might seem a bit counterintuitive to some but you don’t actually have to be a good swimmer in order to enjoy snorkeling. How so? Well, snorkeling is not so much about swimming as it is about floating. In fact, it is recommended that you don’t use your hands at all while snorkeling and instead rely entirely on your legs. It goes without saying that a good pair of fins will come in handy. Make sure you find a pair that fits properly. The right way of doing things is to keep your arms close to your body and use your legs to propel yourself through the water. But don’t flail around too much because you’ll probably end up scaring the wildlife. The goal is to float smoothly while submerged and be at one with your environment. It may take a bit of practice, but in time you’ll learn how to go by unnoticed while you’re snorkeling. It’s going to feel a bit odd at first to breathe through your mouth via a tube at all times. Don’t worry, though, because you’ll be able to learn this important skill in no time. Practice makes perfect so make sure to first try it a few times above water. Doing so will also allow you to test your mask to make sure that it’s still working as intended. Once you get the hang of It, it’s a good idea to take it slow and start practicing in a safe environment. A swimming pool is perfect for this as it will ensure that you will also remain calm during the experience. It’s quite common for first-time snorkelers to start panicking during their first session. However, practicing your breathing beforehand in this manner will greatly reduce the risk of something like that happening to you. Snorkeling can be a very enjoyable and rewarding experience so don’t hesitate to make the most out of it. Once you get a bit of experience under your belt, you will be able to go for longer snorkeling sessions in more exotic regions. That’s when the real fun begins. And if you have a good underwater camera with it, even better. Having said that, you will want to make sure that you don’t disturb the local wildlife while snorkeling. So, try not to touch anything and instead just observe and enjoy the wonders of nature.